Shannon J. Effinger: Tell us about your latest album, The Eleventh Hour, and why the delay in its release. Johnathan Blake: Why the delay. (Laughs) The reason for the delay was that we recorded it last year and I had planned to get it out towards the beginning of this year. But you know, some unexpected financial difficulties came into play so I had to shelve it for a while. That’s why I started this fundraising campaign on IndieGoGo. I finally reached the goal and I’m really excited because now I can move forward. I started this campaign right after I mixed the record and we kind of just sat on it until I was able to recoup some of the funds and now it looks like it’s a go. It was great because we’ve been playing some of this music for a couple of years now. The band has gotten tighter as we played, so it was definitely time. We knocked most of it out in one day and we were scheduled for two days. Ben Street, who played bass on it, got another gig and he had to leave the session on the first day early, so we only had like three or four hours at the most to record. I’ve known all these guys for so long and they were all there, just playing their hearts out, to help [this album] come into fruition. Are all of the musicians featured on this album from your core band? It’s mainly the core band, but I do have a few guests on there. The core band is a quintet and everybody in the quintet has played the music since the inception of the band, with the exception of pianist Robert Glasper, who’s a regular pianist in my quintet. He’s just been getting busier so it’s been kind of hard to nail him down for this date. I got Kevin Hays, who I hadn’t played with in a really long time. It was just really great because Kevin just brought something different to the music and it gave it a different texture and sound. It brought a freshness to the music because we have been playing it for so long, so it’s nice to get someone else’s input on it. I was really happy that he was available and he just really shined on it. And with the guests, Robert [Glasper] did actually make the second day of recording so he plays on three tracks, one of which is his original composition that I love called “Canvas.” Tom Harrell, is a special guest on two of the tracks. Actually one of his tunes is on the record also, an original composition called “Blue News.” There’s another track by film composer Randy Newman and this particular song is taken from the movie that I really liked with Robin Williams and Robert De Niro called Awakenings. It’s a really great song called “Dexter’s Tune.” The reason why Randy called it that because Dexter Gordon is one of the actors in the film and when the song is being played, Dexter is mimicking like he’s playing piano. I did a quartet version of that on the album with Mark Turner, Kevin [Hays] and Ben Street. Tim Warfield plays on a track, he and Mark [Turner] do like a two tenor thing, which is great. And Grégoire Maret, who’s an harmonica player, is on two tracks. It’s great when things come together and go past your expectations and I’m really proud of that. What direction are you taking musically on this new album? How much of the album consists of your own original compositions? Out of the 10 songs, I wrote seven of the tracks. I really try to think melodically. I write a lot of tunes that will have people walking away singing or whistling them. Not necessarily all the time, but that’s what I like when I go out to listen to music. I like to hear music that sticks with me, music that I’ll remember after walking out of a club or theater. As a drummer, it’s just natural for us to think of everything rhythmically and it’s more of a challenge for us to think more melodically. I’ve been trying to get away a little bit from writing compositions solely based on rhythm. A lot of that comes from the fact that I started out on melodic instruments like violin and piano, so when I go to write compositions, a lot of times I hear a melody first before I hear the rhythmic idea under the song. So that’s kind of the direction I’m trying to pursue. During the fundraising campaign for the forthcoming album, have you taken the time to work on any new material? Actually, when I set out to do this recording, it was to really get the music that I had been playing for so long out and recorded so that I could move on. In my case, I sometimes feel like I can’t move on if I have other compositions that haven’t been recorded. I feel like there’s a monkey on my back so I have to get something out. After I finished the new record, I had already started working on some new material. You always want to challenge yourself and grow as a musician and writer by doing it over and over. I hope to put out another record-hopefully sooner than it has taken me to get this one out. (Laughs) I’m already working on that same direction, melodically, but with a few of these tunes, I’ve started coming up with some rhythmic ideas to go with some of the melodies that I’ve come up with. It’s really been interesting to hear the changes in my music and I want to continue to evolve as a musician and writer. Tell us about some of artists who have influenced you as a musician. First and foremost, my father [John Blake, Jr.] is probably my biggest influence. Because of him, I was hearing music when I was still in the womb. When I was born, my father was performing with the great Grover Washington, Jr., who I think is one of the masters at playing and creating beautiful melodies. Then my father did a five-year stint with McCoy [Tyner] and that gave me a whole other element of energy. And I just watched how my father adapted to playing these different styles, one that’s more groove-oriented/funk/R&B and one more straight ahead, hard bop. I think he instilled in me first a great work ethic and then he had me really seek out melodies in songs. My father used to play different records and check out what each individual was doing. He never forced anything on me but when he saw that I was interested in music, he was like “Man, I want you to check this out.” He instilled that value of learning the melody. That in turn manifests itself in my drumming. I think more melodic now when I’m playing and also when I’m practicing, I do a lot of exercises where I’ll play melodies from standards on the drums. I adapt them for a solo drum piece by tuning my drums to different pitches. I also learn a lot just by watching Tom [Harrell]. Tom has been diagnosed with paranoid schizophrenia. What I learned most from him is just his level of concentration. It’s already hard enough trying to play music, but try to play music when you’re hearing voices to distract you. Whenever I have the opportunity to share the stage with Tom, I see how focused he is and once the horn goes to his mouth, it’s just amazing. It’s really fascinating to see that. I don’t know if you know anybody with this condition, but he basically hears these voices that will say things like “Tom, stop playing, you sound terrible.” They think it’s reality and it’s not. I really respect what he’s been able to accomplish and how he’s played on all of these different stages. What I’ve also learned from him is his gift of composition. Tom is not only a great player, but he really has a knack for his compositions. He’s one of the guys that I had the pleasure of seeing perform live early on. All of the music that I had heard I was able to walk out and sing. He just had these really singable melodies. It’s funny because a lot of his melodies are almost childlike, but the harmonies underneath are really challenging. It’s kind of deceptive because you think you hear the melody and then you go over to play one of them and think “Oh my God, this is really challenging.” I love that about him. Some of my recent compositions, I can hear that they’ve been really inspired by him since I’ve been lucky to play with him for six years now. I think that my favorite is Elvin [Jones] by far. For me, he’s one of the drummers that really changed the whole shape of how jazz drumming would be played. I really respect people who go against the grain and are not afraid to do something different. To me, he was one of these people that I gravitated to because of that. It was just so different from the other styles of jazz drumming that I had heard. I remember the first time ever meeting him, it was like we had known each other forever. When he was playing at The Blue Note in NYC, he literally put me on stage next to him while he played, which was a really surreal experience. How did the music of Philadelphia impact you as a young musician? From McCoy Tyner, Shirley Scott and Hank Mobley to The Stylistics and Gamble & Huff, growing up in Philadelphia, musically, was just so rich. There were so many places to hear different types of music. I remember my parents a bunch of times taking me to see The Philadelphia Orchestra. I can remember each time just sitting there and nothing could break my concentration. I was just focused. When I started to gravitate towards playing the drums, I was more influenced by the drummers that were coming out of Philly like Bobby Durham, Philly Joe Jones and Mickey Roker. For me, Philly drumming has a certain sound to it and I wanted to be able to have that. Being exposed to that at an early age helped shaped where I was going. When I was coming up, I was tight with The Roots, Musiq Soulchild and Bilal, who grew up right around the corner from me. All of that was a melting pot for me and it helped me to pick and choose certain things. I was in shock when I had the opportunity to finally play with The Philadelphia Orchestra and they performed Duke Ellington’s “Three Kings Suite.” It was a great honor to share the stage with these people that I grew up watching as a boy. Whenever I go to play the drums or compose, I often recall certain things from childhood and write from my experiences. 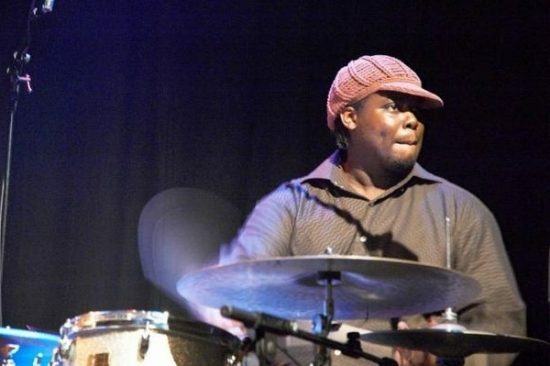 Be sure to catch jazz drummer and composer Johnathan Blake live for a week-long engagement at The Village Vanguard with the 3 Cohens Sextet beginning on Tuesday, November 1. To learn more about his upcoming album The Eleventh Hour and find out when he’ll be playing in a city near you, please visit his website.